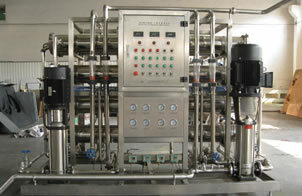 The reverse osmosis equipment, also called RO equipment, is main component in water purification system. This equipment can remove most of inorganic salts, and almost organic matters and microbes in water. During separation process, RO equipment has features of no phase change, high desalination rate, small in size, easy automatic control, and no environmental pollution. The RO membrane in reverse osmosis equipment is the advanced DOW spiral-wound polyamide composite membrane. The average desalination rate of a single membrane is over 98%. concentration. So the service life of RO equipment is largely prolonged. Since RO water treatment system is inevitably polluted sooner or later, we furnish automatic flushing device and pharmaceutical irrigation device with our RO water treatment system to wash off contamination and guarantee the high efficiency water treatment performance of the system. 1. Semi-permeable membrane has selective permeability, and this membrane let water permeate but not salt. 2. The impressed pressure difference between brine compartment and fresh water compartment is larger that that of osmosis pressure difference, thus it can drive water to move from brine compartment to fresh water compartment. 3. The reverse osmosis technique is used to remove impurities in water such as inorganic ions, bacterium, viruses, organic matters and colloids, thus high quality purified water can be obtained. RO-3 reverse osmosis equipment is equipped with 6 pieces of 2 core 4 pressure membrane tubes and 12 BW30-4040 composite reverse osmosis membranes produced by USA DOW Company. The water inflow capacity is 4m3/h. The operating pressure 0.8--1.5MPa. The water yield is 3m3/h, and the concentrated water discharge is 1m3/h. And the desalination rate is over 98 %. The yielding water quality is monitored online and showed by conductivity meter. Founded in 2006, our company is a leading manufacturer and supplier of reverse osmosis equipment (RO system water treatment) in China. Here in Topling, we mainly offer water filling line, juice filling production line, carbonated drink filling line and related equipments including water tank, beverage mixer, silica sand filter, and other related machines. We offer installing and debugging services of our devices and staff training for factories abroad and OEM service. For more guides of reverse osmosis equipment , please contact us.